EDUEXPO - Interest in Slavic University is constantly growing! 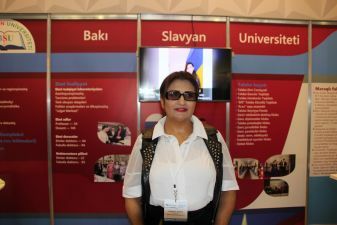 “We try to regularly take part in the International Education Exhibition, and we are confident that the current event will increase interest not only in studying at the Baku Slavic University, but also in our scientific research. At the exhibition, our stand provides full-fledged information about numerous international awards and diplomas, including training programmes. We also publish monographs and scientific journals; there are 11 centres, including those of the Polish, Czech, Roman-German, Turkish, English and the Slavic Peoples at our university; there is a regular and effective exchange of students as part of their activities. Students' interest in our university grows from year to year. The education is conducted in five faculties: Azerbaijani Language and Journalism; International Relations and Regional Studies; Pedagogical; Translation; and Philology. We expect some new faculties to be opened at our university. Recently, we celebrated the 70th anniversary of the unique journal “Russian language and literature in Azerbaijan”, which is published by our university. We also pay careful attention to the development of cultural relations as part of international co-operation; for example, we have a plan to arrange the performance of our ensemble “Arzu” with the dance “Tolerance” at this exhibition tomorrow.